Before making any plans to travel to Nepal, get the most recent update on the 2015 Nepal earthquake disaster. Manfred Häupl of Hauser excursions reports all trekking routes in Nepal, including Helambu – Langtang are open as of March 2016. 4000m+ valley north of Kathmandu, parallel to the Tibet border. Plenty of challenging side trips up high. days are short, especially in the gorge, in November. There’s much more light in the Spring. the reputation is “generally easy hiking” on good trails with a light pack. Some challenging, potentially dangerous sidetrips possible. Know that Langtang is not all that easy. There are many more ups and downs than you’d expect. Langtang trails are not expensive, but many spend more than they anticipate on luxuries. We spent about $30/day in 2014. Cheapskates about $20/day. be clear — you might have to QUIT if by bad luck or rushed ascent you suffer altitude sickness (Acute Mountain Sickness or AMS). some suffer respiratory problems. Headaches. Or fatigue. walk with no tent, stove or food. Stay in lodges, eat in simple restaurants. safe and easy to hike independently. Even solo. guest houses sell “hot (solar warm) showers” for about $3. bird lovers will be thrilled with this region. Lammergeyers fly highest. no dogs in the Langtang valley. Therefore no dangerous dogs. Though Langtang is the closest major trekking area to Kathmandu, it’s not close. There’s a long, awful bus ride to the traihead. Some vomit on this trip. if you acclimatize well, and have enough days, it’s relatively safe and easy to get to Kyanjin Gompa. carry a tent if you want to overnight at Langshisha Kharka. Or to go further up valley. November 1995 a freak snow storm killed dozens (46 some say) of hikers, porters and guides throughout the Himalaya, most by avalanche. The October 2014 Nepal snowstorm disaster killed at least 43 people including at least 21 trekkers. Main trails are safe. But crossing glaciers is can be difficult and dangerous. Get local advice before you do so. some hikers buy Diamox in Nepal. It’s called Diamox Sequels in the USA. Others bring homeopathic coca as is used in the Andes. 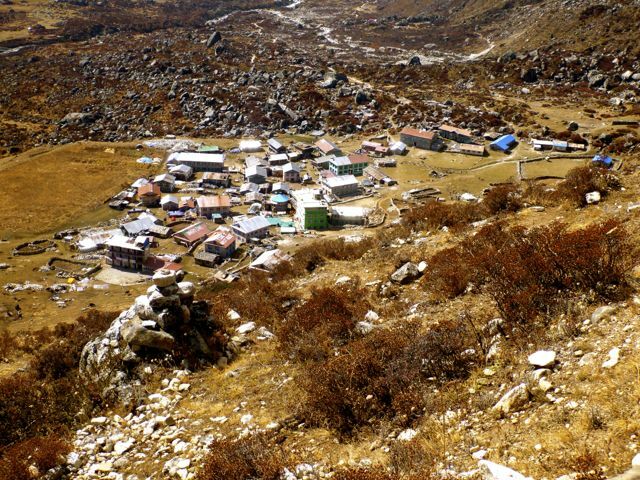 Langtang valley lags behind the other major trekking areas in modernization. That’s both good and bad. cold kills batteries. Keep them in your sleeping bag at night. no teacher, no school. Older kids go away to boarding school. some lodges have very poor pillows and mattresses. Consider bringing your own air mattress and/or inflatable pillow. Some bring ear plugs. treat all water (except the H20 coming off the highest peaks). “squater” pit toilets are the norm. It’s a rare treat to find a sit down loo. you’ll be tempted by pizza, beer, bakeries and everything else. Almost everyone spends more money than they expect. Exodus charged about $160 / day in 2014 for a high end guided tour. By shopping around you might pay $50 / day (2 people) for a guide, but you’ll be carrying your own pack. It will be more if you also want porters or a porter / guide. This site posts information for independent hikers. If you hire a guide, they’ll handle all these logistics. Remember to budget expenses like meals, beverages, travel insurance (including helicopter evacuation insurance), tips, etc. carry more Nepali rupees in cash than you think you need, in case of emergencies. Lodges and restaurants normally only accept rupees. We took about $700 each in rupees for 15 days. Bank ATMs give you only 1000 rupee bills. Step into a couple of banks to change some of those to 100 rupee bills. a Mars bar in Kathmandu might cost Rs.70. At high altitude, the price could go up to Rs.200. The higher, the more costly. boiled water is surprisingly expensive. Bringing your own stove and fuel is a good idea. there’s a slight chance you’ll need to be evacuated. Bring a credit card just in case. on your travel insurance check what the policies cover under “Adventure Sports”. It varies depending what nation you live in. World Nomads has been recommended. Some of their policies cover trekking up to 6000m. Check whether or not your insurance has any helicopter evacuation restrictions. In Kathmandu you should purchase your TIMS (Trekking Information Management System) card. Also your Langtang National Park entry fee. Or have your guide buy those. Happily, both permits are available at the checkpoints en route. the visa on arrival process was simplified in 2014. You no longer need bring passport photos. Nepal loves tourists while, at the same time, trekking in India is a hassle. if you are doing Langtang independently, get a trekking guidebook well in advance. Then decide on your destination each day as you go. That way you can adjust for weather and fitness. It’s fairly common to take a rest day while ascending to acclimatize for altitude. Most people start at Syabrubesi (1500m), a grueling 6–10hr bus ride from Macha Pokhari, in Kathmandu. Consider hiring a private car to shorten and sweeten that journey. from Syabrubesi most take the shortest route up, via Lama Hotel. Better, we feel, would be a longer and slower route via Khangjim. Slowly, slowly is the mantra up. Descend as quickly as you wish, via Lama Hotel, if you like. 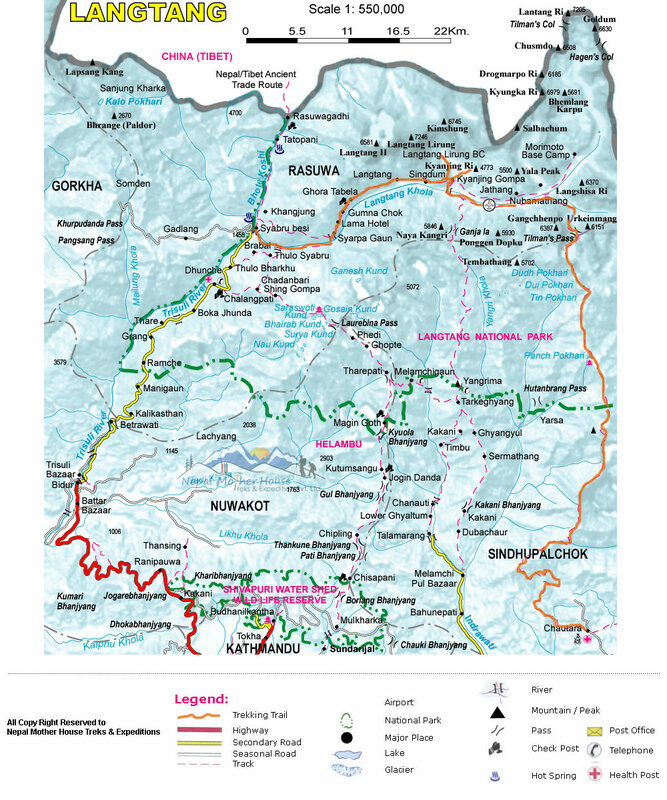 For Langtang, almost everyone needs to get from Kathmandu to Syabrubesi 1500m. It’s simple to organize transport back from the small town, but in Kathmandu it’s not so easy to find transport up into the mountains. Our guidebook (by Bob and Siân) was useless on this critical point. They all left from the same area of town – Macha Pokhari. A taxi from Thamel should cost about $3. Get there as early as possible to be sure to find a seat. 6am would be ideal. No later than 7am, to be sure. Ask around to find the ticket booth. Consider that Nepal offers 15 day, 30 day and 90 day visas on arrival. For the major Nepali treks you normally want a 30 day visa, and at least 21 days in Nepal. Click PLAY or watch a 3D flyover on YouTube. Should you sign on with a guide? Consider that you will then be tied into the group itinerary. You’ll travel only as fast as the slowest person in your group. If not sure, go independently. And — if it turns out you need help — hire a porter, porter-guide or guide and porters yourself on the trail. That can be arranged next day from most lodges. A guide will show you around, but not carry your gear. They may be Nepali or foreign. Many hikers are happier to be led. A good guide may enrich the trip for you. A porter guide is a local who speaks English who may also carry a limited load, perhaps 15kg (33lbs). There is often an insurance fee added. If you are not confident to go independently, check Trip Advisor, Trekking Partners and other online sites for recent recommendations. Don’t sign on with any company until you are sure they can deliver what you want. We don’t recommend any on the list below. It’s simply a starting point. If you sign on with a guide, let them organize everything. You are there simply to follow. And enjoy. There’s plenty of time to go off day hiking on your own. visit Kathmandu after you trek, not before. Many get sick in Kathmandu. Get sick after trekking, not before. We used Pritchard-Jones and Gibbons in 2014. It was disappointing. We wished we’d simply taken the Lonely Planet Langtang chapter, instead. Lonely Planet Trekking in the Nepal Himalaya (2009) – Bradley Mayhew & Joe Bindloss – is the first guide you should pick up. A Trekking Guide to Langtang: Gosainkund, Helambu and Tamang Heritage Trail (2014) – Sian Pritchard-Jones and Bob Gibbons we found disappointing. Essential information for independent hikers is missing. Yep. We still like Lonely Planet best. Get the most recent edition. Every shop in Kathmandu sells Langtang maps for $2-3. Pick one up when you get there. Leave a comment if you’ve got an up-to-date trip report to recommend. Click PLAY or watch a short edit of a 2008 trek on YouTube. Check our blog for posts tagged “Langtang”. Thanks for the trip report. I have a question about tipping. You mentioned about 15% for guide and staff. Are you suggesting that amount for each person? For example, I recently did a trek. There were 5 trekkers in our group with 3 porters and 1 guide. Are you suggesting that the guide and each porter gets about 15% OR that the overall amount should be about 15%? Thank you. 15% tip split between all the clients. For example, if you paid your guide 15%, each of 5 clients would pay 3%. Good question. Last I heard it was officially closed. But it might be possible to go independently.